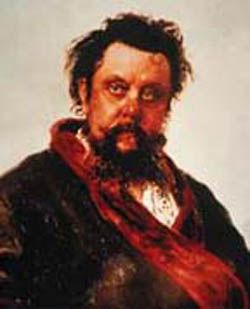 A documentary video trying to bring out the other side of Mussorgsky, the real him. This other side of him, the one lying in waiting beneath Rimsky-Korsakov’s compositions, the person who, in the words of a person who knows him well, is “more good, more clear, and more human. This personality is what the DVD is seeking to bring out. Modeste Mussorgsky: Towards New Shores Video (DVD) traces Mussorgsky musical development from traditional romantic to Pro-Impressionist. The video looks at his musical excerpts ranging from songs he performed in the house where he grew up to Boris at the Bolshoi. This illuminates the reason behind his acquired talent and his discovery of new chordal possibilities. The DVD then looks at his abandonment of operatic tradition, showing the growth and fruition of his music, bringing out its Russian-ness. Plays for 78 minutes.